Flexible entry to our workflow! „brand meets print“ – in this complex process, we render services in areas in which they are the most effective. In this process, the responsible team remains in full control. A central project and data management ensures that nothing is left to chance. The diagram shows a sample workflow. 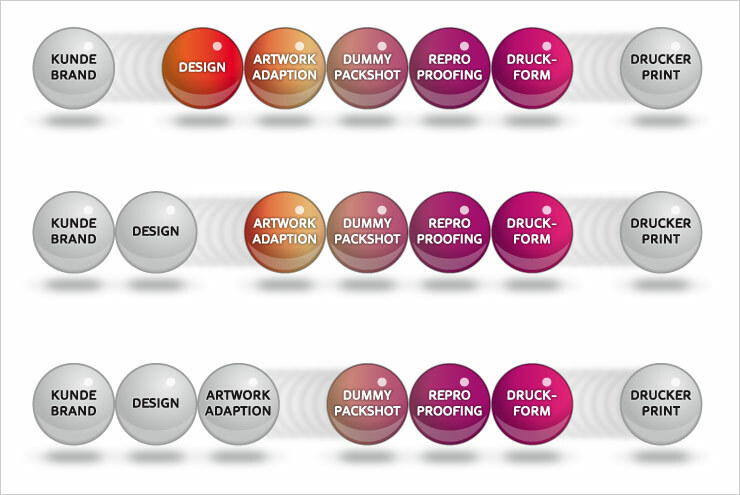 Your workflow or the workflow that will culminate in your finished package could look similar. The Workflow Management System is an essential and clearly-arranged map for your packaging projects in real time. It serves as an information platform for projects and all related documents. At a glance, there are past (archive), presence (online check and approval) und future (milestones) of your packaging projects right on your screen. It allows quick access for all members internally and externally – including allocations of permissions – obeying your requirements. Brilliantly simple design and application – user focussed. Projects may be started, tracked, checked and approved on your own. For mobiles like iPhone or iPad, there are clients available in iTunes App Store.